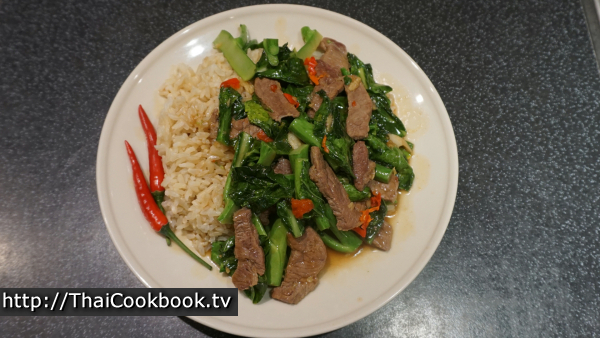 Most people have had the Chinese version of broccoli beef, but our Thailand version takes this traditional favorite up a notch with the addition of hot chili and authentic Thai seasonings. 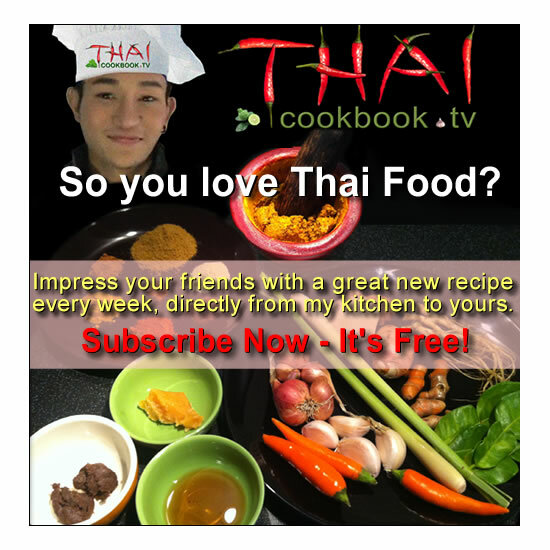 In Thailand we use Kana, our version of a broccoli type plant that has sturdy green leaves and a small broccoli flower at the top, but you can use this recipe with regular broccoli and it will come out great. Select a nice and soft piece of beef tenderloin, add a few things to it, and enjoy. 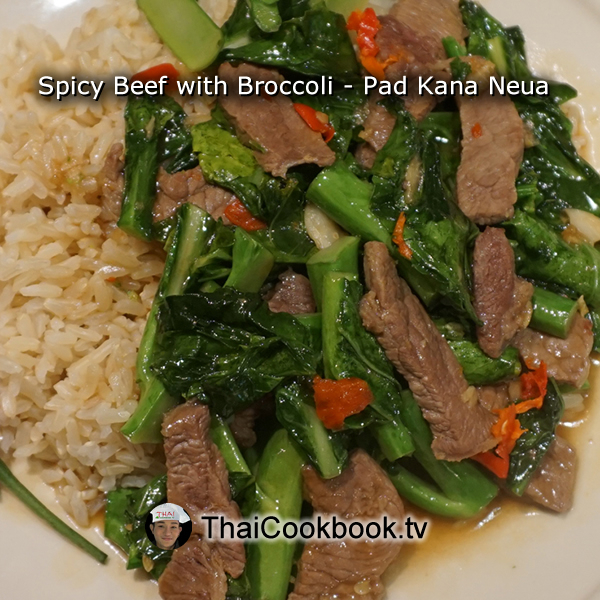 What's in our Spicy Broccoli Beef. 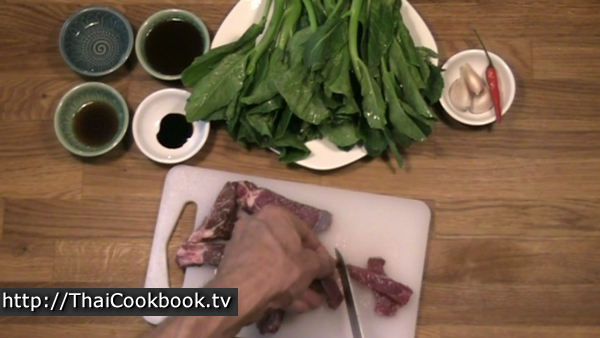 How we make our Spicy Broccoli Beef. 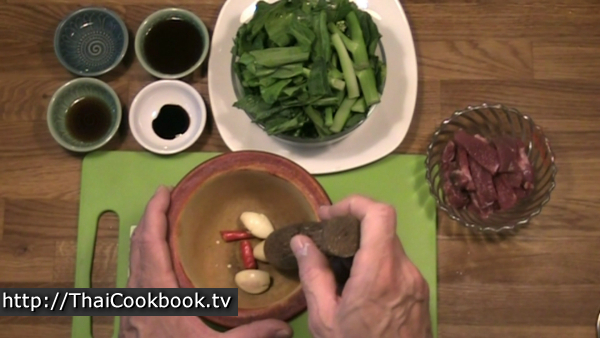 1) Slice the beef tenderloin into thin strips, cut the broccoli, and grind the garlic and chili together. 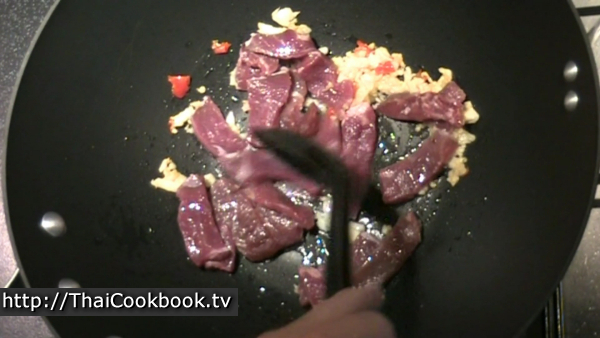 2) Fry the garlic and chili for a minute, then add the sliced beef. Fry it together for about a minute, then add the soy and oyster sauces. Cook until thick and bubbly. 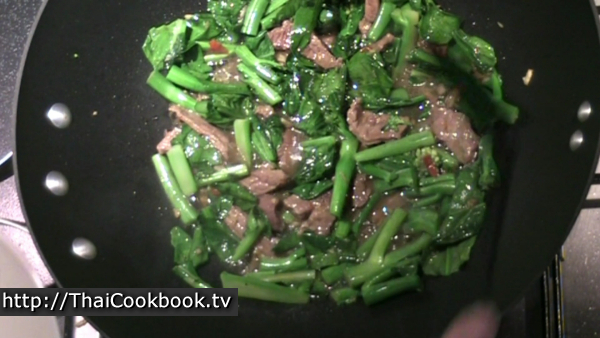 3) Add just a little water to make a rich sauce, then add the broccoli. Fry it all up for about a minute, then serve. Select a nice, soft piece of beef tenderloin, and slice it across the grain in thin and even strips about 1/4 inch thick. 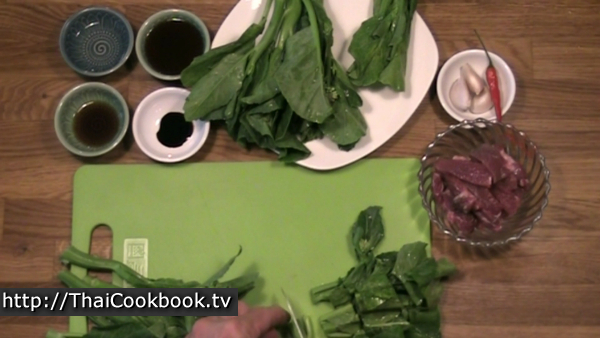 Cut the Chinese broccoli across the leaf and stem into 1 1/2 inch pieces, and split the larger stems. 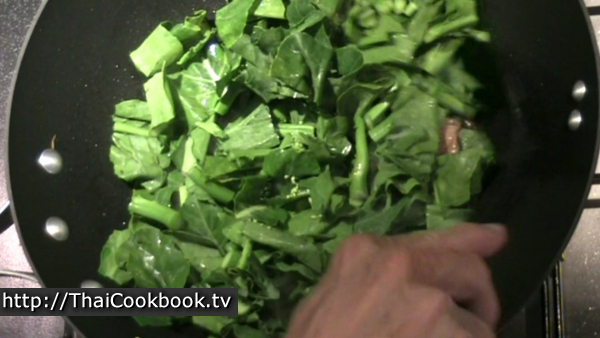 If using regular broccoli, section it and cut it into large pieces. Roughly grind the garlic and chili together. Large and chunky pieces are ideal for this dish, as you want to show off the chili against the green of the broccoli. 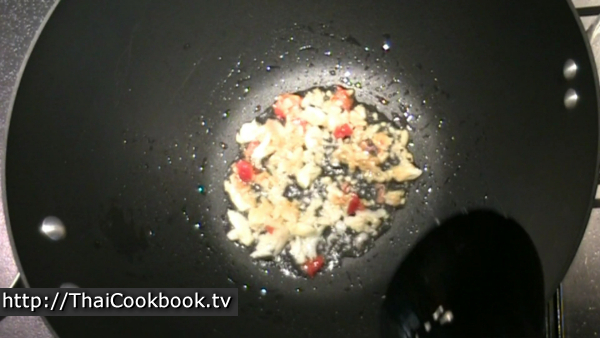 Use a warm wok or deep frying pan, and add 1 tablespoon of oil. Let it heat up slowly, then add the garlic and chili when it is warm. Watch the heat at this point, as the garlic will burn easily and spoil the flavor. Just fry it slowly for about a minute. Add the beef slices to the chili and garlic, and fry it for about a minute, stirring often. 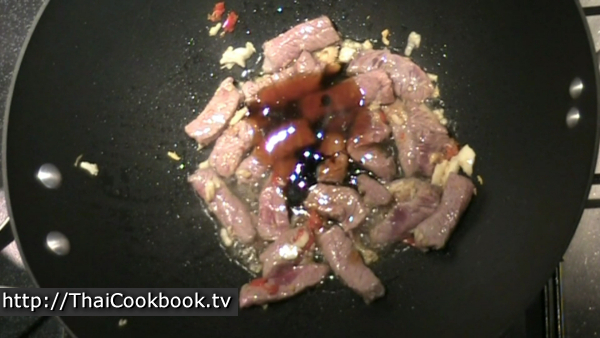 When the beef is nearly cooked, add the sauces and stir them in well. Turn the heat up high now and let it get really hot and bubbly. When the sauces are hot and sticky, and it looks like it might burn, add just a little water to deglaze the pan. Stir it up well to get all those flavors back into the sauce. When it's hot and bubbly again, add the broccoli and toss it in well. It will take less than a minute for the broccoli leaves to wilt. Turn off the heat now and let it cool down. The broccoli should be bright green, and a little crunchy, so cook it less than you might think for best results. Serve as one-dish meals with steamed wholegrain or white jasmine rice, or put it all on one big plate to be shared and eaten with other foods. 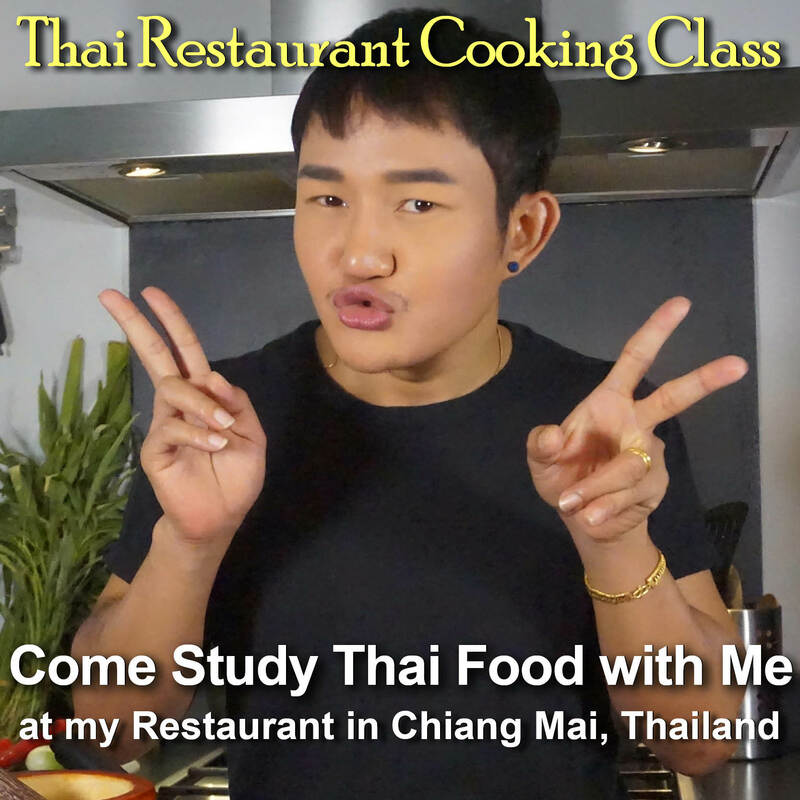 A couple of Thai hot chilies on the side as a garnish is a nice touch that will really make the dish look Thai.